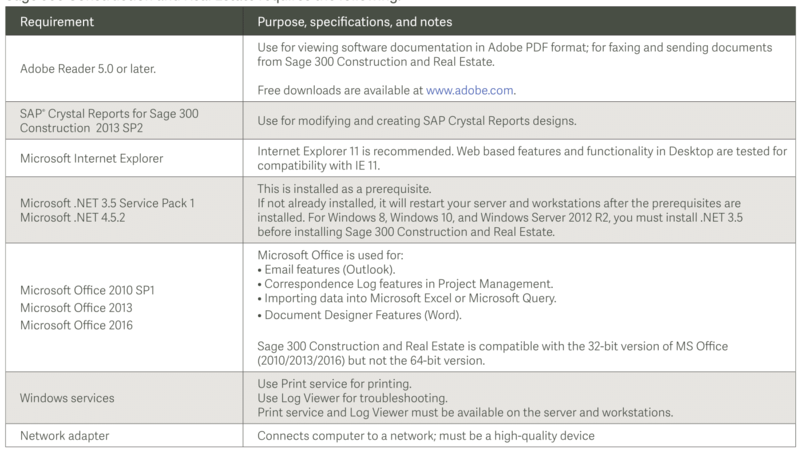 If you’re installing or upgrading Sage 300 Construction & Real Estate (CRE) software, you’ll need to know about the hardware and system requirements we provide below. Additional Sage 300 Construction system requirements may be necessary depending on your specific technology configuration, integrated 3rd party applications, and other factors that may require additional consideration. Be sure to contact the support team at Accordant Company if you need assistance. Looking for system requirements for an older version of the software? Scroll to the bottom of the page for archives. Starting with version 17.1 of Sage 300 Construction and Real Estate (released August 2017), 32-bit operating systems are no longer supported for servers or workstations. Each situation is unique and yours may vary. However for average daily processing loads, we recommend that servers have multi-core processors with base frequency of at least 3 GHz, 32 gigabytes or more RAM, and solid state drives (SSD’s). Workstations must have 64-bit installations of Windows 8.1 or Windows 10. If you are not planing to implement SQL Replicator or Mobile Projects, you probably don’t need to upgrade your server for this release, assuming it performs adequately today. Your server can continue to run on Windows Server 2008 R2, 2012, or 2012 R2. Small or standalone systems can continue to use Windows 7, Windows 8.1 or Windows 10. If your workstations are 64-bit and you are satisfied with their performance, you probably don’t need to upgrade them. Any 32-bit workstations must be replaced with 64-bit systems. If you do plan to implement SQL Replicator, verify that your server’s resources are sufficient to handle the additional components. You might need to upgrade your server. For average daily processing loads, we recommend that servers have multi-core processors with base frequency of at least 3 GHz, 32 gigabytes or more RAM, and solid state drives (SSD’s). The operating system can be Windows Server 2012 R2 or 2016. If your workstations are 64-bit and you are satisfied with their performance, you probably don’t need to upgrade them. Any 32-bit workstations must be replaced with 64-bit systems running Windows 8.1 or Windows 10. Should I use a virtual or hardware server? What type of hard drives do I need? How much RAM does my server need? What type of server processor (CPU) do I need? Which operating system do I need? Which edition of SQL Server do I need? Server hardware and network requirements may vary depending on your specific system and software, such as the number of users on your network or other programs that might use server resources, such as firewalls, software applications, mail systems, and so forth. That said, here is what we recommend as a set of minimum hardware requirements. NOTE: you can click any of the images below to zoom in for a larger view. *Note: Before installing Sage 300 Construction and Real Estate on computers with the Windows Server 2012 or Windows 8 operating system, you must install .NET 3.5. Do not install Sage 300 Construction and Real Estate products until you have sufficient hard disk space available. Note: Sage 300 Construction, Sage 50, and Sage 300 (formerly Sage Timberline Office, Sage Peachtree, and Sage ERP Accpac respectively) cannot be installed on the same computer, as they use different versions of Pervasive that are not compatible. In order to install and use Sage 300 Construction and Real Estate Version 15.1, your server and workstations must have Internet access due to Pervasive licensing requirements. In order to install and use Sage 300 Construction and Real Estate Version 16.1, your server and workstations must have Internet access due to Pervasive licensing requirements. Leave your name and contact information below. One of our friendly Sage consultants will follow up with you shortly.